They say, you can see every issue that Ocean has in a single drop of water. They also say, “the dogs bark, but the caravan goes on”. So within today’s professional world “water drops” are scientific and production conference meetings that concentrate not only on the issues but also on their possible solutions. Since it is the places where representatives of each and every industry area gather to talk business. To continue our metaphor, the “caravan” here is portrayed by representatives of the business community, who assess the risks of multi-billion dollars investments – for oil and gas sector – in projects with life cycles measured in decades. People who comment on such projects as a rule conform to considerations that are quite different. It can be the representatives of a biased mass media, often following the short-lived burning news with catchy headlines, mainly made to attract attention and create an appearance of conflict, to intrigue around a particular project. Or it can also be representatives of a no less biased part of the political spectrum, whose interests do not extend beyond the current electoral cycle in their constituency (whether it is a local municipality, a region, a country, or an interstate union/association). And this cycle is always shorter than the life cycle of any oil and gas investment project. That is why the opinion of the business community often turns up to be the most balanced, prudent, showing you the most realistic scenario for the further development of events against the background of yet another media and political information mess. On January 28-30, the 12th annual European Gas Conference was held in Vienna. As usual, it had around 300–400 participants, mainly representatives of different spheres of gas business in Europe – domestic and international, vertically-integrated and specialized companies from different segments of the gas industry, gas transmission system operators, energy regulators, etc. Europe was, is and will be the main export market for Russian gas. The words “turn to the East”, so fashionable in Russia nowadays, should be regarded in the gas sphere not as a call for substitute, but as an addition to the European direction of Russian gas supplies. Therefore, it is very important to understand how the prospects of this export are seen not only by the leaders of Russia and Gazprom, but also by representatives of the European gas industry, both from the business side and from pan-European and domestic regulatory authorities. A conveniently diverse cross-section presented itself at the Vienna Conference. Position of the Russian side was unequivocally stated in the speeches of the Gazprom management representatives that opened the conference. For instance, the Chairman of the Board of Directors of the company, Viktor Zubkov, recalled that Russia has additional, i.e. yet unclaimed in the domestic and foreign markets production capacities, approximately of 100 billion m3 per year. And the General Director of Gazprom Export, Elena Burmistrova, emphasized that the Russian Federation could, in the future, keep the current – newly achieved – record level of gas exports to Europe, which in 2018 amounted to 202 billion m3. I.e. Russia and Gazprom are ready to turn this newly established record into a new standard. We have both the resources and determination to do that. But this is how the Russian party regards this matter. What does the European party think of it? Public sources of today reflect escalation of European political concern over the growing “dominance” of Russian gas in the EU’s energy balance. This concern is mainly based on the opinions of the “new” Europeans and USA. And this is despite the fact that gas is much more environmentally friendly than alternative fuels – coal in the power industry, liquid fuel in transport. That is, replacing these more “dirty” energies with gas contributes to the implementation of the COP-21 - Paris Climate Agreement, initiated and most actively supported by the EU. Moreover, Russian gas turns out to be way cheaper than many other types of gaseous fuel supplied to Europe (be it pipeline gas or LNG). And upon commissioning of the new pipelines, it will be even cheaper and even more competitive. For example, the system of Russian gas supplies to Europe from its new production center in Yamal via Northern Russia, based on the North Stream-2 underwater pipeline through the Baltic Sea, is much shorter and much more modern, more innovative and more reliable than the existing delivery route through Central Russia and Ukraine, constructed in the late 1960s, from Nadym-Pur-Taz region – the current key gas-producing region of Russia which is giving up its dominant role now to Yamal. This means that the costs and risks of transportation through the NS-2 are much lower, and Gazprom can get an acceptable margin at lower prices in Europe. I do agree with the frequently repeated statement of Spencer Dale, Chief Economist of BP, that imported LNG has factually lost the global competitive standoff in the EU to the Russian pipeline gas. This is well illustrated by the fact that the load factor of European regasification receiving terminals remains at 25–30% of their full capacity, since the main LNG flows are oriented towards regions with more favorable price situation — primarily that is Asia, Middle and Near East, Latin America. Therefore, the arguments against Russian gas are mostly non-economic in nature. They all can be basically summed up as if Russian gas is “not democratic enough”, just like some think of our country in general. I think there is one main goal to it – to expand the zone of presence in the European market of “more democratic” LNG (also more expensive, as recognized both in the East and in the West) imported from the USA. American liquefied gas will account for about half of the LNG production in the Atlantic basin. Qatar and Australia, the other two largest world producers of this energy source are, as well as projects starting on the East African shelf, have an obvious competitive advantage over the American LNG in the premium gas market in Asia. Their delivery route to Asia is much shorter. Main American liquefaction plants are located on the Gulf of Mexico shore, from where the shortest route to deliver LNG to Asia is through the Panama Channel. This channel is a logistical bottleneck for US LNG deliveries to Asia Pacific although its third stage of construction (extension) was specially designed for the passage of standard methane-carrying vessels. Therefore, Europe is gradually becoming nor the balancing, but the target market for American LNG. But here, alas, it is losing economic competition to Russian pipeline gas. Therefore, the task of EU politicians in the framework of “transatlantic solidarity” is to assist an ally (i.e. US LNG) and counteract the potential adversary (Russian pipeline gas, or, if you want to put it that way, “Putin’s gas”). After all, “every tub should stand on its own bottom”. But pragmatic representatives of the European gas business see the picture differently. 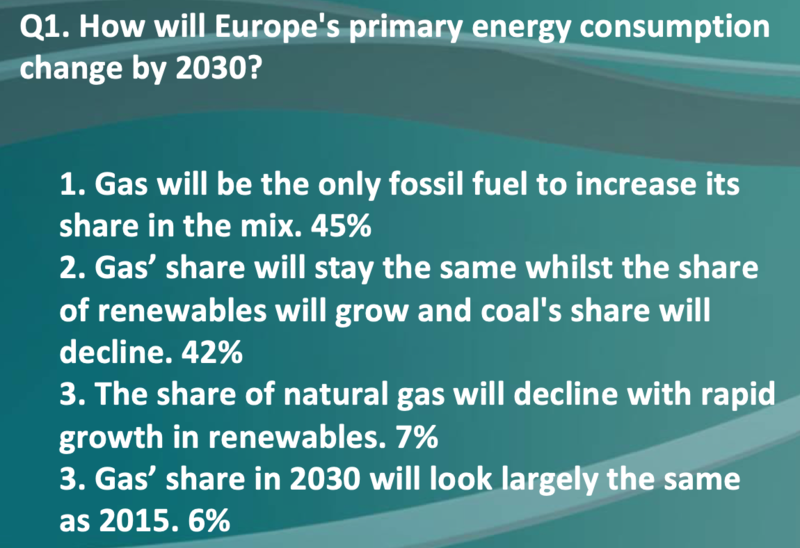 A survey conducted among the audience of the European Gas Conference showed very pragmatic and potentially (I want to highlight this, potentially!) rather optimistic (positive) results for Russian gas in Europe. The author was among the five panelists who were invited to comment on the results of the survey for each of the questions submitted for voting, so the following is a “first-person ...” impression. The audience was asked six questions. Each had four to six answer options. [Note: Questions are outlined at the end on this article]. The survey was held live, with the results displayed on the screen. Voting on each survey question took several minutes. Therefore, it was possible to see not only the final result, but also how the ratio of the answers changes over time, with more and more participants pressing the buttons to give their answer. Answers to the first question (Q1) showed that almost 90% of the conference’s audience believed that by 2030, the gas share in the European energy mix will either stay the same, with the share of renewable energy sources (RES) increasing and the coal share decreasing (42%), or will increase overall, to become the only fossil fuel to increase its share in the fuel mix (45%). It is noteworthy that the main part of the institutions that are one way or another connected with the European Commission predicts different levels of decrease of the gas share in the EU energy balance. Gas is regarded as merely a “transitional bridge (fuel)” to the fully electrical EU world based on renewable energy, where gas will just have the role of backup fuel for renewable electricity production (see “Q1…”). Thus, almost nine-tenths of the professional audience do not agree with the media and the audiences close to political and environmental spheres in their opinion that gas will have to go, that it will serve only as a transitional bridge to the all-electric (RES-based) energy world in Europe (“digital, electrical, renewable”). Experts do not agree that the gas will later have to vanish as an anachronism that has outlived itself, as one of the fossil fuels, even if it is the most environmentally friendly of those (they say, “less harmful to ecology”). At the same time, I noticed an interesting pattern (and I have mentioned this on the panel). The first answers to the survey were apparently given by the so-called "gas optimists." I.e. those that cast their votes emotionally, straight off the reel. 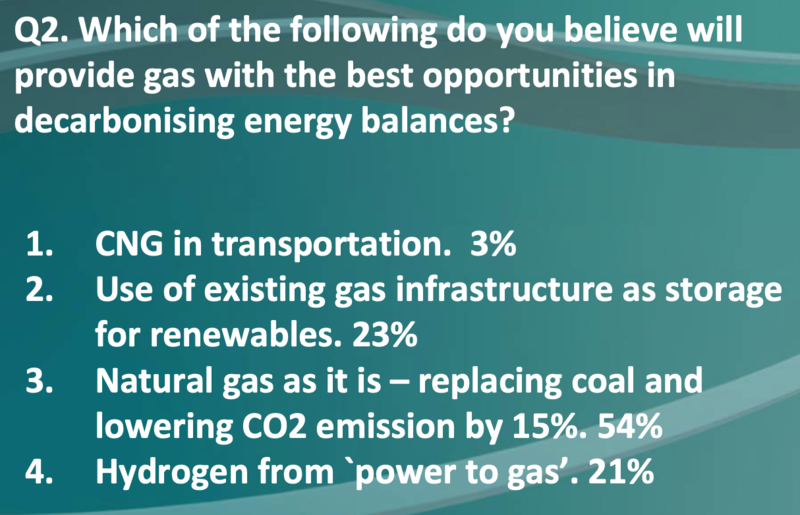 And at first, the share of the answer that said “gas will be the only ...” (the first option at Q1 list), exceeded 80%. Then, apparently, more cautious delegates began to vote. And the share of the first answer decreased, hitting the ratio level of the second option that said that RES will be replacing coal but gas should remain to balance the irregularities of electricity production based on RES. Apparently, these respondents took their time to contemplate the matter and took into account the old policy of subsidizing renewable energy in Europe. They may have thought that it will remain in one form or another, based on the EU's commitment to the climate agenda, still understood as widespread introduction of renewable energy. It has been repeatedly shown that when accounting for the full cycle of electricity production based on renewable energy sources, including the manufacture of equipment for its generation (especially solar energy, for example, solar panels – photoelectric converters), the carbon footprint (CO2 and other pollutants emissions) are not lower and significantly higher than when using gas. Many representatives of the European Commission repeat it like a mantra, that gas should conquer its market niche solely in a “fair” competition with other energy resources. At the same time, the previous multi-million (or even multi-billion) subsidies for renewable energy do not seem to be taken into account. That is, no energy source (including gas) will no longer receive any subsidies that were once so generously bestowed upon RES. In fact, the struggle of subsidized renewable energy sources with unsubsidized gas was and is going on under the slogan of replacing “dirty molecules (fossil fuels, including natural gas) with clean electrons (RES). But at the same time, another goal is kind of swept under the carpet – replacement of “imported molecules” (read between the lines: Russian gas) with “domestic electrons”, that is, RES produced within the EU. Although the (sometimes more “dirty”) production of equipment for the generation of "domestic electrons" has long since moved to China and other developing countries with lower production costs. However, even in the conditions of the aforementioned support for renewable energy and countering natural (that is, primarily Russian imported) gas, the gas business — those who make decisions about investing in gas or alternative projects — expect at least preservation of the role of gas in Europe's energy balance in the next decade. This provides sufficient “pause” to effectively adapt to the challenges. First of all – for deep “technological decarbonization” of the energy (and gas) industry in the decade after 2030. The second question and the answers to it (see "Q2 ...") reflect, in my opinion something that can be called "predetermined short-termism”. The wording of the question held no indication of the time horizon. Therefore, by default, it can be considered as a suggestion to evaluate the immediate and more distant prospects for the development of the gas industry in terms of its contribution to EU decarbonization. But the list of suggested answers predetermined “short-termism”, that is, focus only on the short term, within the horizon of application of commercially developed technologies for decarbonization of the gas industry (and the way they are seen in Europe today). This set up a background for a so-called “near horizon” (the one that is closer in time) and the “narrowed spectrum” (an incomplete set of technical solutions, in a different status of R&D and commercialization processes). But today, Russia shows a wider range of technical, economic and managerial decisions on the deep technological decarbonization of the gas industry. At first glance, the answers paint a bright landscape for the gas industry. Option number three was chosen by more than a half of the respondents. It correlates very well with the most frequently given answers to question one, for in both cases we are talking about the displacement of coal by gas. Such a “structural decarbonization” is an obvious priority measure, which is now also recognized in Europe. We also would like to remind that earlier the “coal lobby” and trade unions actively opposed it, primarily in Germany and Poland. This kind of decarbonization predetermines a further increase in the import demand for gas, which also correlates well with answers to questions three and four (about LNG imports) and five to six (about imports of Russian pipeline gas). Answer options two and four are interrelated, and, in total, they gained about half of the votes. We are talking about the production of hydrogen with technology called "electricity -to-gas" (or “power-to-gas”/PTG), which uses electricity for the electrolysis of water to produce hydrogen. However, there may be two options for the use of electricity. The first is to take it from the grid (power grid) to ensure a continuous hydrogen production process, which increases the prospects for funding such projects. However, in this case, hydrogen will not be “environmentally friendly”, since more than 20% of electricity production in the EU today is accounted for by coal. This means that the production of hydrogen that is "environmentally friendly" (during its usage) is carried out using electricity that is "environmentally dirty" (during its production). The second option is the production of so-called (according to EU terminology) “green” hydrogen that is, obtained from renewable electricity considered to be green in the EU. However, as we noted above, it is not so green after all, if “environmentally dirty” production of equipment for the generation of electricity from renewable energy sources is taken into account, for example, in solar power plants. This means that the "excess" renewable electricity (that is, produced during periods of, for example, active sun and wind) can be directed to the production of hydrogen by electrolysis of water. Moreover, it can be done at zero or even negative costs, since this may turn out to be more beneficial than a temporary reduction in the load factor of wind power plants or solar panels. But due to the unpredictability of weather conditions, and therefore intermittent (lacking a pattern) and “ragged” nature of this way of hydrogen production schedule, this technology for producing “green” (in EU terminology) hydrogen is, in my opinion, non-fundable. It cannot provide a justification to banking community (which provides project financing for such projects) for the return on investment in such projects. The production of this so-called “green” hydrogen is aimed not only and not so much at its final energy usage (when it is converted into useful work) or non-energy-related usage (when it is used as marketable product), but at its usage as an intermediate commodity. That is, for storage in the existing gas infrastructure. Here one can see the interrelation of the answer options two and four for the question two. Hydrogen can be stored – unlike electricity which is still lacking relative large-scale storage technology, with the exception of pumped storage hydroelectric power plants (PSHPPs). For instance, in the USA, where the scale of electricity production from renewable energy sources is many times higher than in Europe, current share of PSHPPs is 97% of all electricity storage capacities. But there are very few PSHPPs in Europe – they are mainly concentrated in mountain areas. Therefore, interrelation between answer options two and four means favorable prospects for gas industry in terms of using the existing gas infrastructure – gas transmission network (GTN). For example, gas transmission capacities becoming available due to a planned decline in production at the Groningen field in the Netherlands, up to its complete shutdown in the next few years. At the same time, “electricity-to-gas” (power-to-gas) technologies leave behind the technology for producing hydrogen from methane. The latter implies not only the use of existing GTN capacities for hydrogen storage, but also an increase in the supply of natural gas for its subsequent technological decarbonization followed by hydrogen extraction. In the EU, they talk about technologies for producing so-called “blue hydrogen” from natural gas using, for example, steam reforming, in which case, however, CO2 emissions also occur. This means that in order to meet EU environmental objectives, it is necessary to use CCS (carbon capture and storage technology) jointly with these technologies for producing hydrogen (within the framework of the same investment project). However, such technologies for producing “blue hydrogen” (according to EU terminology), accompanied by CO2 emissions, leave out of the picture the technology of hydrogen extraction using oxygen-free technological processes that take place without CO2 emissions (pyrolysis, cracking, plasma chemistry). For example, the ones developed in Russia within the framework of PJSC Gazprom projects. When used, they allow to produce hydrogen and solid carbon. No CO2 emissions. Yes, today these technologies are not yet so common, they are still mainly at the R&D stage and have not reached the level of widespread commercialization. Their use is a more distant prospect than the electrolysis of water or steam reforming of methane. But they cannot be ignored, because in this case the prospects for the use of natural gas (read between the lines: Russian pipeline gas) in decarbonized Europe are narrowing even more. The use of technologies for producing hydrogen from methane without CO2 emissions means, first and foremost, that costly CCS will not be required, and that will help significantly decrease the cost-estimate of any project. Secondly, production of hydrogen from methane without CO2 emissions means expansion of the gas scope of application, and therefore an increase in the demand for imported gas in the EU. In this case, gas completely ceases to be a “dirty” fuel. As already noted, in the understanding of climatic maximalists, it is traditionally one of the types of a priori “dirty” organic fuel, even though it might be the cleanest of them. Now, natural gas becomes really “clean”, since the production of hydrogen from it (using the above oxygen-free technologies) is not accompanied by CO2 emissions that need to be disposed (captured and sequestrated). We would also like to note one interesting and presumably important detail. At first, this technology with the same abbreviation CCS was defined as “carbon capture and sequestration” and not “carbon capture and storage”. So a certain trade-off must have taken place. In February 1987, the then Soviet economist Grigory Khanin and publicist Vasily Selyunin published an article “The Quizzical Number” in the “Novy Mir” magazine (maybe the most famous Soviet publicist magazine of that time). It went off like a bomb, completely debunking the "lulling" indicators of Soviet economy statistics. I do not seek to cause a similar effect, but still I want to say a few words about the "quizzical letter." “Sequestration” and “storage” are fundamentally different economic concepts. Sequestration (in this case of CO2) means that product is only transferred in one direction, only to “dump” it in a storage facility that performs the function of a landfill and provides no possibility of taking the disposed product back to use it. At least within the same investment cycle of the project. Storing the same product (for example, natural gas) means that it is possible both to pump it into storage (dump) and to pump it out of storage (take). Storage facilities in this case is not a landfill, but a tool for temporary storing the product, which thus becomes a commodity. For example, underground gas storage facilities (UGS) are a widespread and vital technical solution for the uninterrupted operation of the gas industry, smoothing seasonal and/or short-term fluctuations in gas demand in addition to contractual supply flexibility tools (in the case of long-term contracts). Expanding this S in CCS as “sequestration” means that the costs of product disposal will be covered by the item “expenses” without the prospect of their return (pay-back), making the project budget heavier and worsening the prospects for its ROI and competitiveness. While interpretation of the S in CCS as “storage” implies that such costs can be considered as investments, since storage is temporary. This is merely a pause in the productive use of the goods, not excluding the return on investment in CCS. That is, this replacement of letters makes it possible to perceive (present) technical solutions on decarbonization with the obligatory use of CCS in a much more favorable light (first of all, to the uninformed public from different circles). But in the end, many projects with CCS will still not be funded due to the extra expenses in their cost estimates. So, the combination of two and four answer options to Q2 predetermined the limited prospects for the usage of gas in the decarbonized world due to the limited nature of the decarbonization solutions “wired” in there, especially in the part of hydrogen production. However, the first answer option to the Q2 also predetermines a significant underestimation of the possibilities of using gas – this time as gas-engine fuel (GEF). This answer offered to evaluate the prospects for the use of GEF in transport – but only in the segment of compressed natural gas. And this means a significant limitation of the very formulation of the question of the prospects for the use of gas in the transport sector. For beyond the scope of this question is the use of liquefied natural gas (LNG) in transport – both in the sea and on land. But it is LNG that has the most favorable prospects for use in sea and river transport as a substitute for naval oil fuel. And on land, as an alternative to diesel fuel in rail transport, in motor transportations (especially in the heavy truck segment for long hauls), in city public (communal) services and commercial sector transport services (buses, public cleansing vehicles, wholesale and retail supply networks, etc.). The use of LNG, primarily of small-scale LNG, has great prospects. In particular, it concerns the Black Sea-Danube water area, which actually represents an enclave, its Turkish straits closed for entry and exit for LNG vessels of any jurisdiction. That is, additional opportunities are opening up for deliveries of Russian LNG directly to the end-use segment, directly to the retail market of the respective European countries. This is different from the supply of pipeline gas and large-scale LNG, which enter wholesale market of any state first. This Black Sea-Danube enclave creates obvious additional demand opportunities for Russian small and/or medium scale LNG (in the case of its production in the Russian sector on the Black Sea coast). Questions three through six were related to demand prospects estimates for imported gas in Europe, which according to a general view could be covered by Russian pipeline gas and LNG. 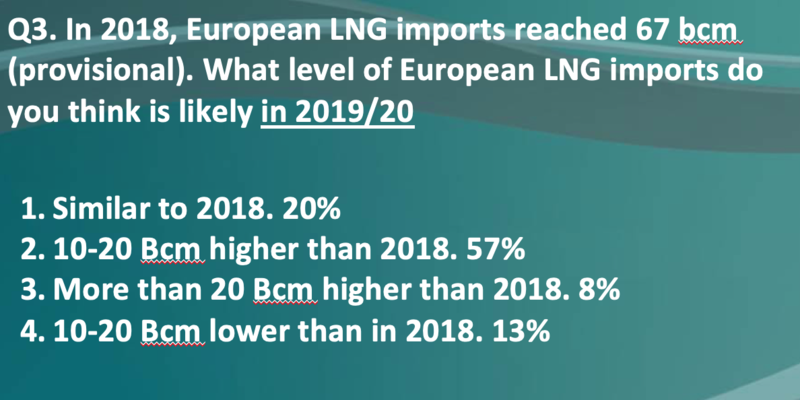 Answers to questions three (Q3) or four (Q4), starting from a preliminary estimate of LNG imports to Europe (67 billion m3 in 2018), stated that three quarters of the audience thought that in 2019-2020 LNG imports would continue or grow by 10–20 billion m3/year, that is, almost by third in the maximum answer option (see “Q3…”). And four-fifths of the audience felt that by 2030 it would grow by 10–20 billion m3/year or more (see “Q4…”). 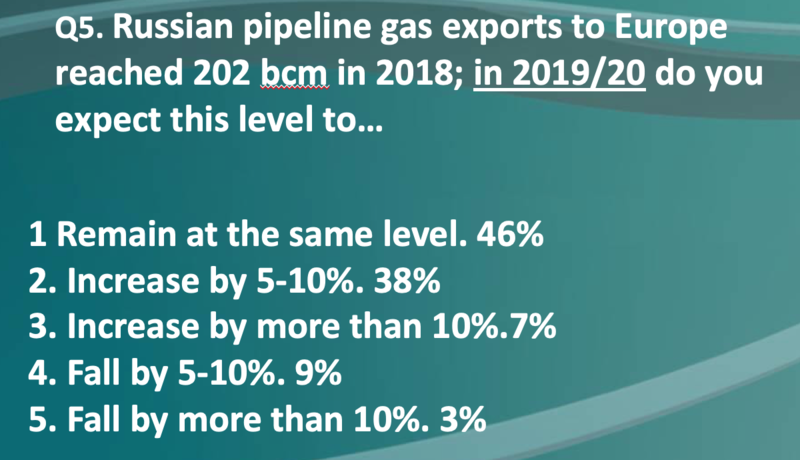 At the same time, answering to questions five (Q5) and six (Q6), based on an assessment of pipeline imports of Russian gas to Europe (202 billion m3 in 2018), four fifths of the audience thought that said import would either remain the same in 2019–2020 (46%), or will grow by 5–10% (38%) (see “Q5…”). 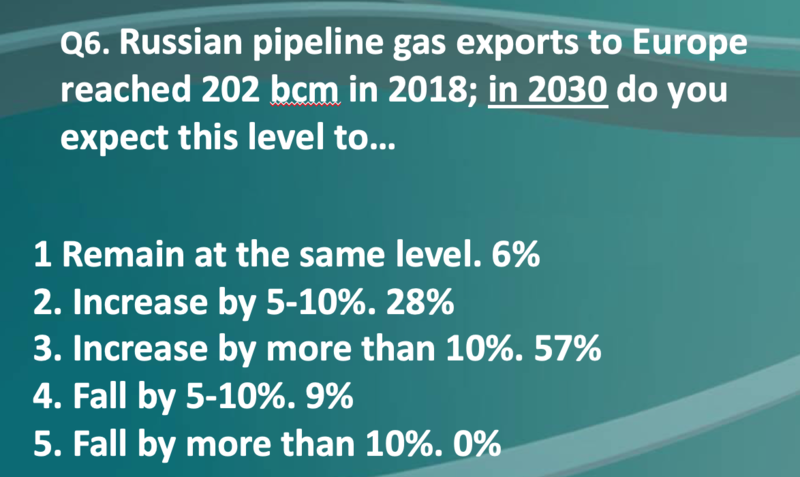 As for forecasts to 2030, nine-tenths of the audience are even more optimistic: 57% believe that pipeline imports of Russian gas will grow by more than 10% against the 2018 level, 28% – that it will increase by 5–10% and another 6% – that will remain the same (see “Q6…”). And this is despite the recently growing rhetoric, forcing concern over the threatening Europe "Russian gas dominance". Which, however, is just the result of its competitive advantages. And this is happening in conditions when it (and other types of fossil fuel) has to compete in the EU with subsidized renewable energy sources. Of course, the voting results could have been partly influenced by the statements of Viktor Zubkov and Elena Burmistrova at the beginning of the conference about the readiness of Gazprom and Russia to maintain the achieved export levels and the availability of required production capacity. And although the international business community is only relatively independent in making multibillion-dollar investment decisions, it certainly is able to independently decide on which button to press in an anonymous vote on matters of its professional competence. I personally think that opinion of the audience reflects a new European reality, which, I hope, will turn into a new standard for it over time. The voting results showed that the European gas community expects growth in imports and LNG, including those from the United States, and Russian pipeline gas (as well as Russian LNG). By 2030, according to the respondents, the import of LNG and Russian pipeline gas may increase by 20 billion cubic meters or more per year. As Andrew Walker, vice president of Cheniere, the main American liquefied gas producer, said at the conference, “both LNG from the United States and Russian pipeline gas will be in demand and will find their place in the European gas market to meet the growing import demand for gas – and this is good”. These additional volumes are the result of a change in the estimates of total gas demand in the EU to a higher level (slowing down of their decline) and deteriorating of the domestic production prospects for Europe. Soon the largest Dutch and 10th world gas field Groningen will be shut down. According to the representative of the government of the Netherlands, this would have happened in any case, regardless of mini-earthquakes, which only accelerate its decommissioning. Norwegian production is reaching its peak point and will soon start to decrease. The displacement of coal and nuclear power plants (for reasons of environmental and radiation safety) also expands the potential niche for gas. All this increases the zone of import gas demand, which can be covered by imported LNG and supplies from Russia. The complex of measures for its deep technological decarbonization, primarily with the use of Russian technologies developed by PJSC Gazprom, can increase the demand for imported gas even more. We are talking about the processes of pyrolysis, cracking, plasma chemistry, oxygen-free, and therefore not accompanied by CO2 emissions. These technologies can be used, at least until a commercially attractive possibility of large-scale electricity storage is found, in addition to pumping technology. This could compensate for seasonal fluctuations in the demand for electricity and level out the weather fluctuations of its production based on renewable energy sources. As a result, the share of renewable energy in the primary energy balance would expand, which would lead to a new round of competition between electric power generation based on renewable energy and decarbonized gas. This would have corresponding consequences for Russian gas. The author would like to thank Sandil Sanmugam (Conference Manager, World Refining Association, Clarion Events, - EGC2019 organising company) and Jonathan Stern (OIES, organiser of the polling session) for providing him with the final results of the poll.